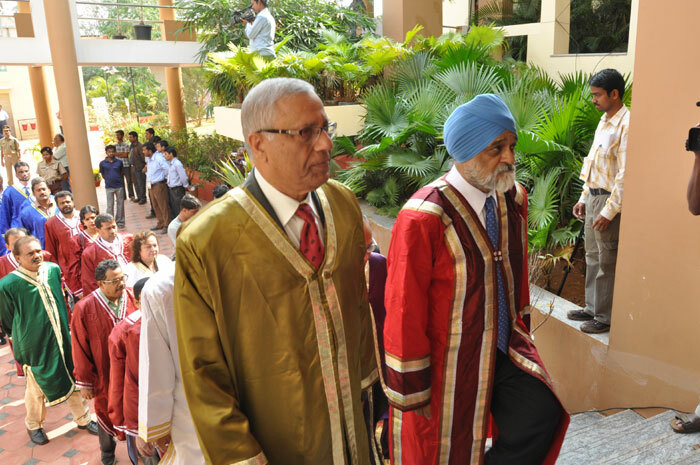 The country has witnessed remarkable growth over the years and the young graduates of today will find themselves in a prosperous India which promises to have five times more and greater structural changes, said Shri Montek Singh Ahluwalia, Dy. 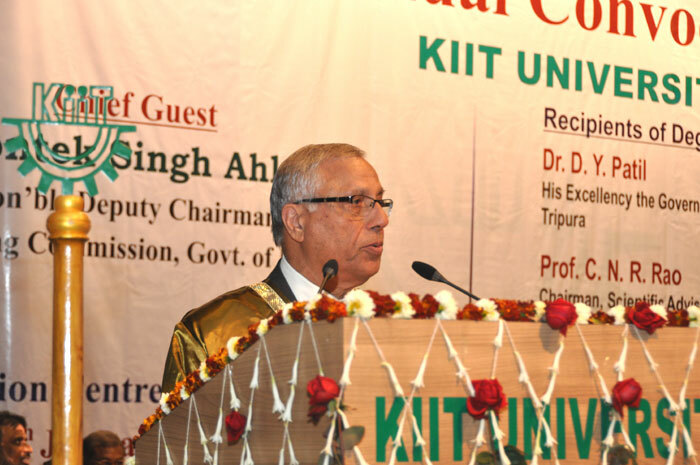 Chairman of the Planning Commission of India, while delivering the Convocation Address at the 7th Annual Convocation of KIIT University on January 6. 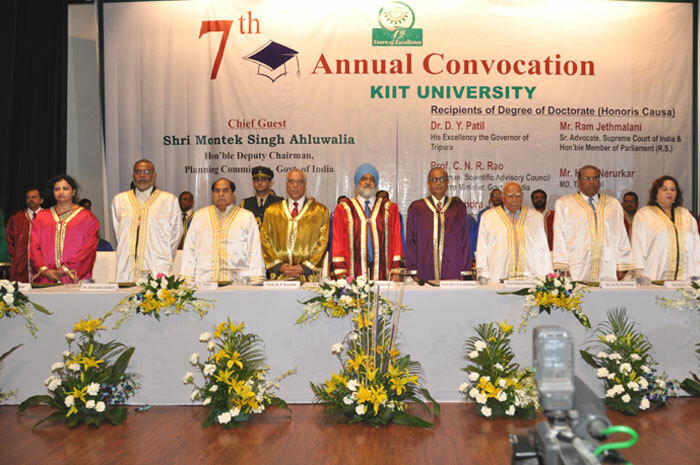 Six eminent personalities of the country were conferred degree of D.Litt. 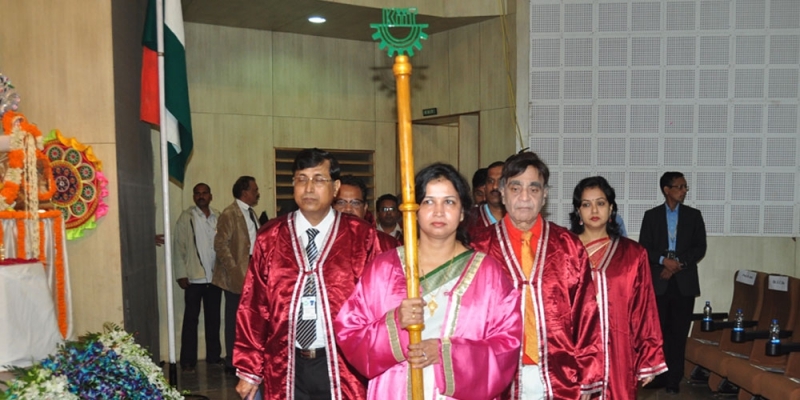 / D.Sc. 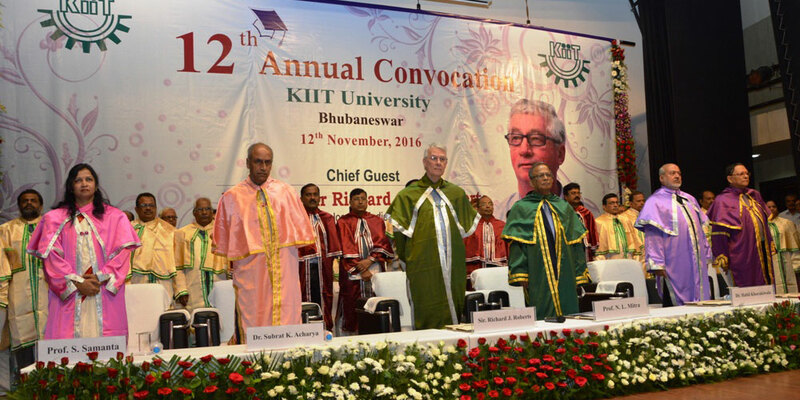 / D.Law (Honoris Causa) by KIIT University. 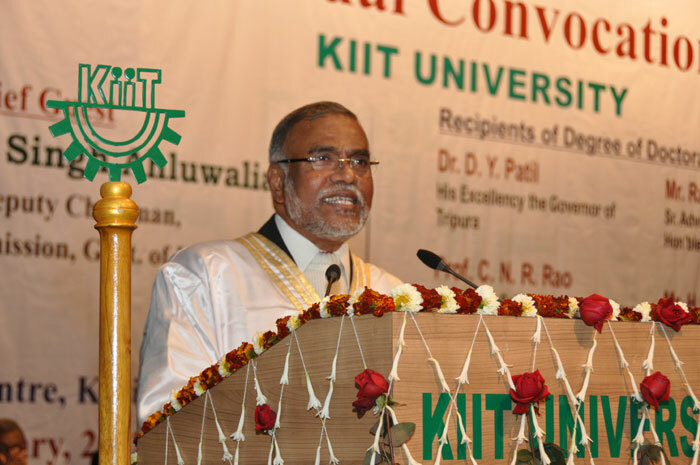 The recipients of Honorary Degrees are – Dr. D. Y. Patil, Governor of Tripura (D.Litt. 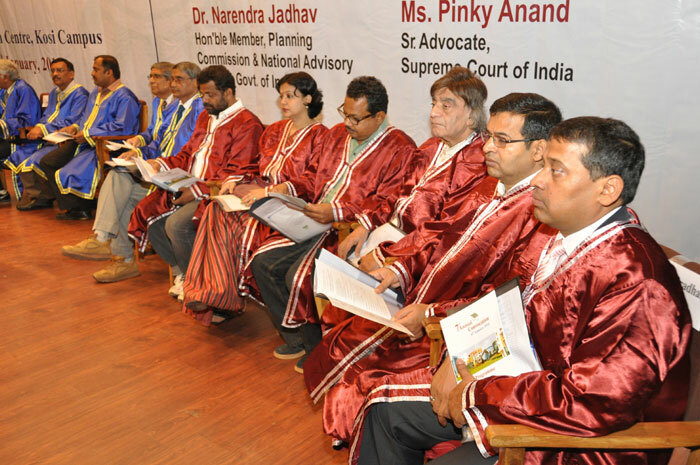 ), Mr. Ram Jethmalani, Sr. Advocate, Supreme Court of India & Member of Parliament-R.S. 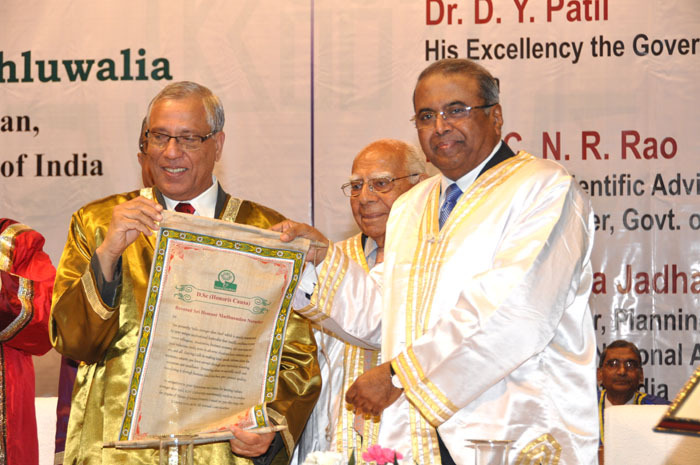 (D.Law), Prof. C. N. R. Rao, Chairman, Scientific Advisory Council to Prime Minister (D.Sc. 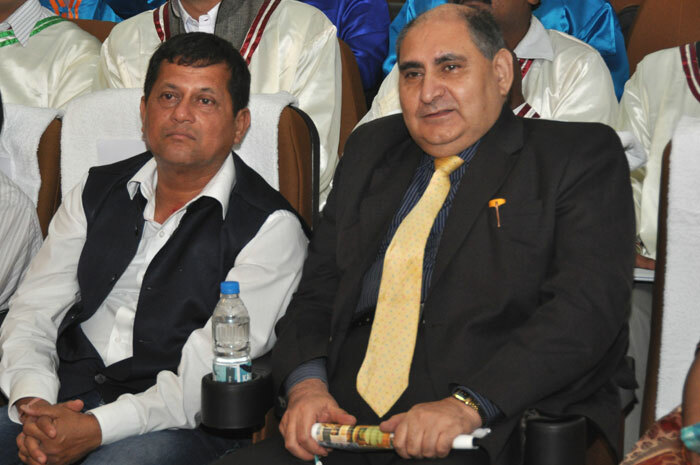 ), Mr. H. M. Nerurkar, MD, Tata Steel (D.Sc. 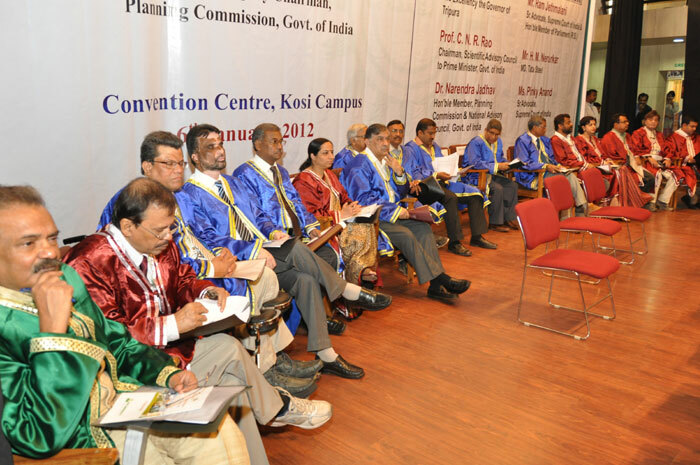 ), Dr. Narendra Jadhav, Member, Planning Commission of India and National Advisory Council (D.Litt.) 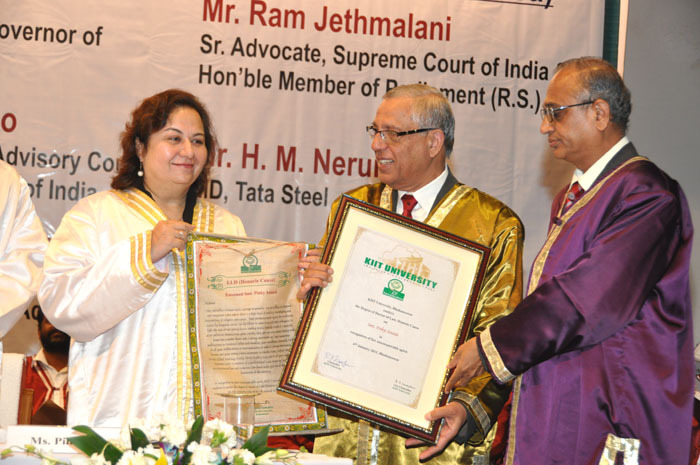 and Mr. Pinky Anand, Sr. Advocate, Supreme Court of India (D.Law). 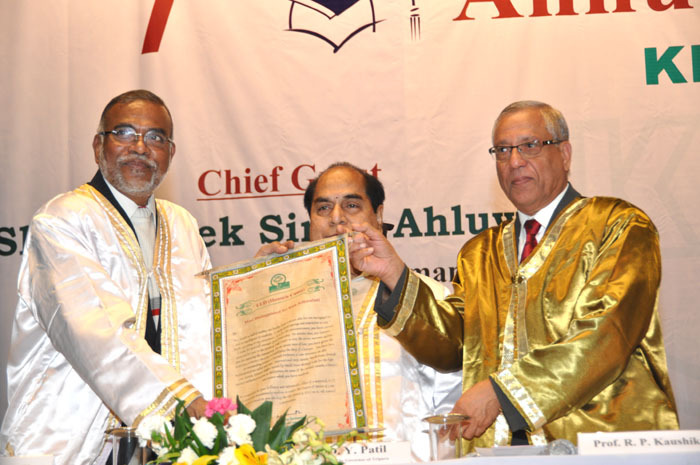 Prof. C. N. R. Rao received the degree in absentia. 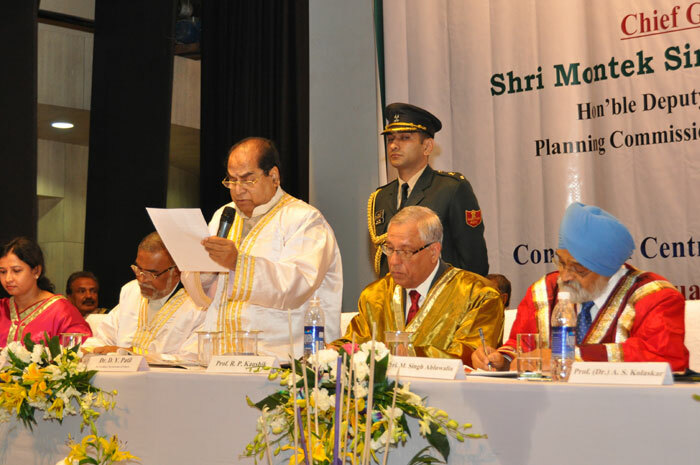 Presenting a comparative picture of the growth, the country has witnessed, Ahluwalia said “India did progress at a slow pace because, while the GDP growth was only 3.5%, the population growth was more than 20%. 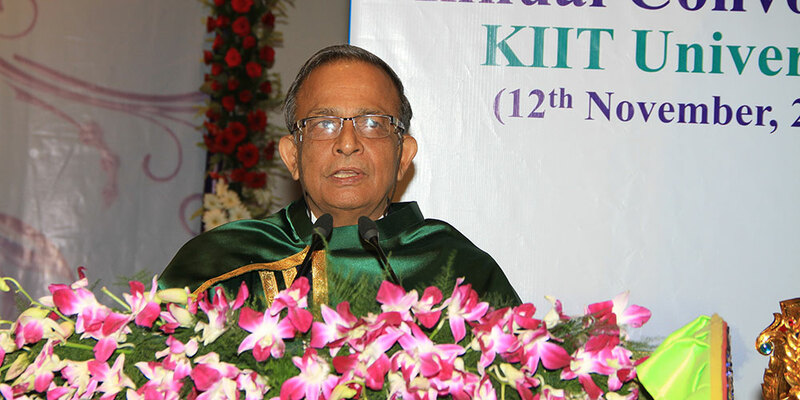 In the 60s, the growth was slowest and this continued in the next twenty years.” Though some economists are skeptical about the growth because of the present slow down, yet in the next 20 years Indian economy is bound to witness an annual growth rate of 8 to 9 percent per year, he said, elaborating that the population growth has slowed down from twenty percent to 1.4% per year and this trend will continue. 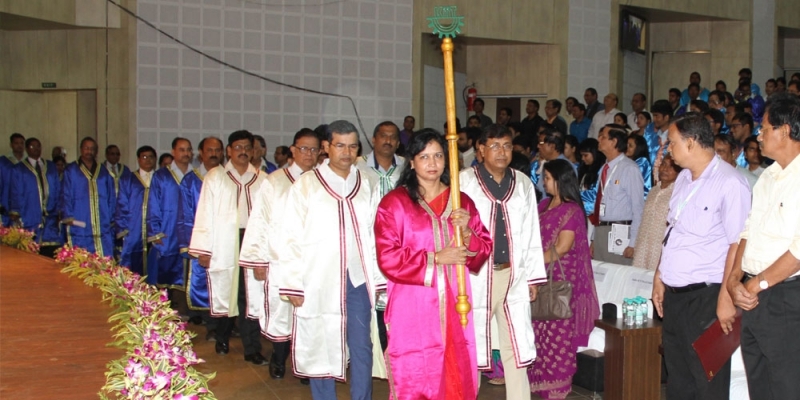 “In contrast to slower growth for the last 45 years, the last nine years have seen tremendous growth in the economy. 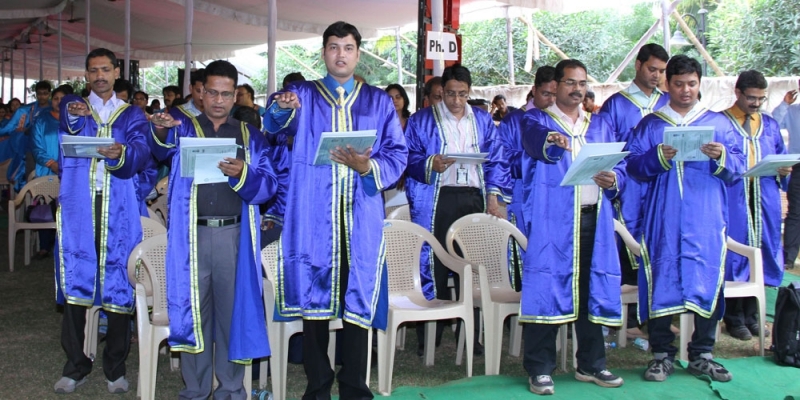 In addition to the structural changes, technology is also changing much faster. 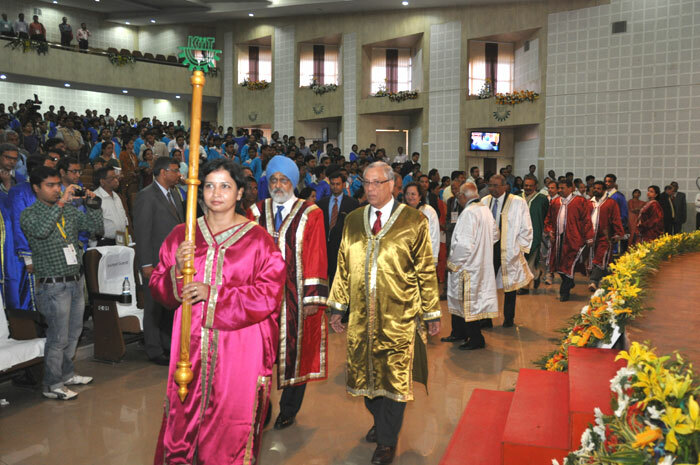 The transmission of the technology is even faster,” Ahluwalia explained. 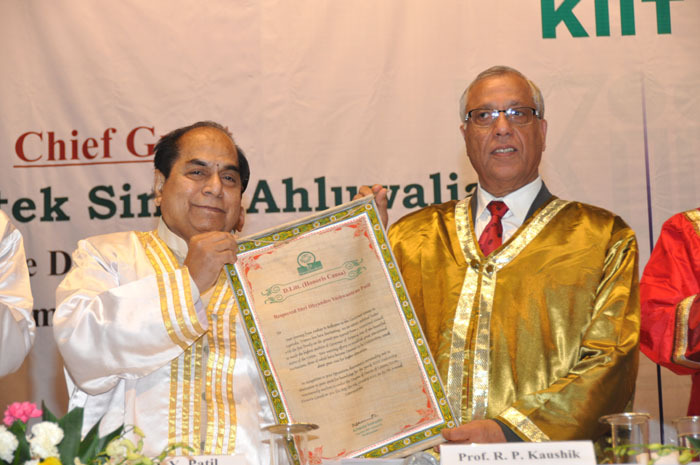 In the sixties and seventies India was being considered as a developing country, but the global perception about the country has changed now, he said, adding that in the changed situation the country is expected to be the third largest economy of the world. 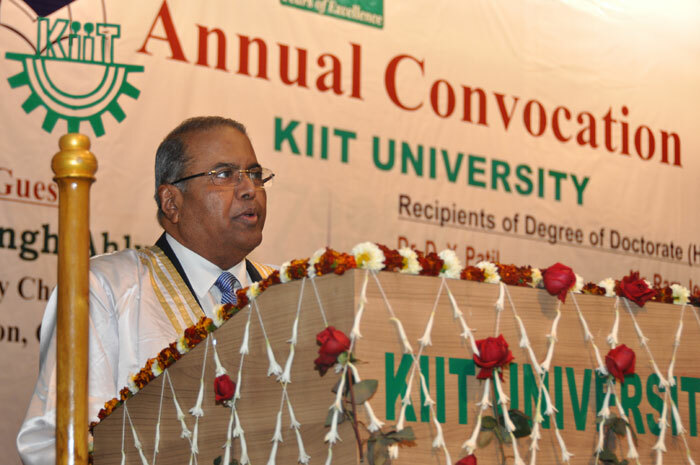 “It is predicted that by 2030, after China and USA, India will be a major economic power,” he said, while emphasizing on the quality of education. 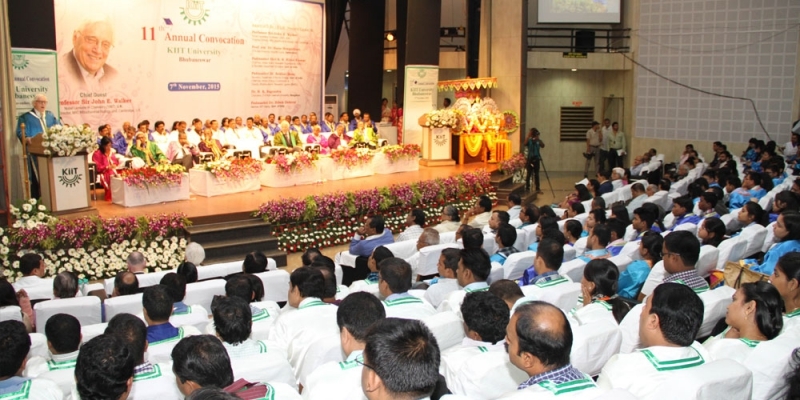 It is not quantitative growth alone that will take the country forward, but it should be combined with a qualitative growth of education and knowledge, he stated. 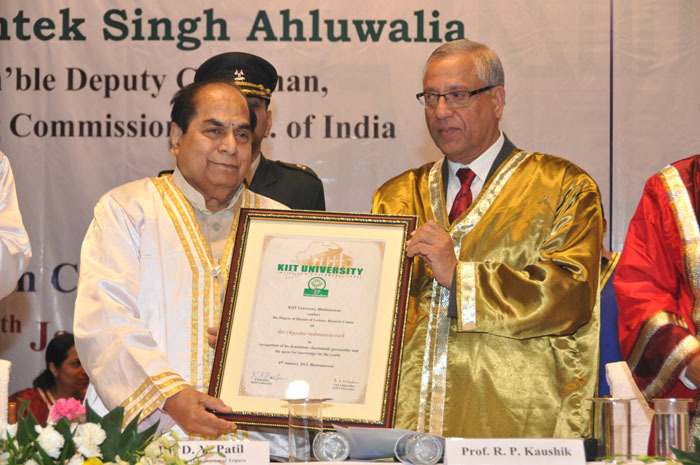 Underscoring the need for Public – Private Partnership in the field of education, Ahluwalia commended the efforts of KIIT in creating an excellent infrastructure and for giving the country a value based education. 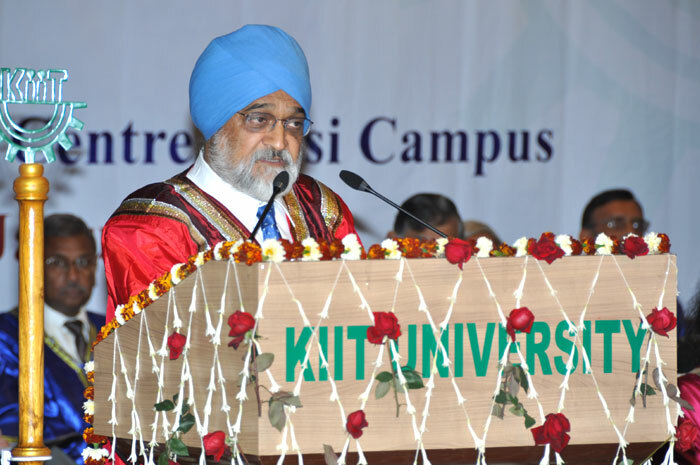 Hailing the efforts of Dr. A Samanta and KIIT, Ahluwalia said that KIIT provided a beckon and showed the way how private players can take up the responsibility. 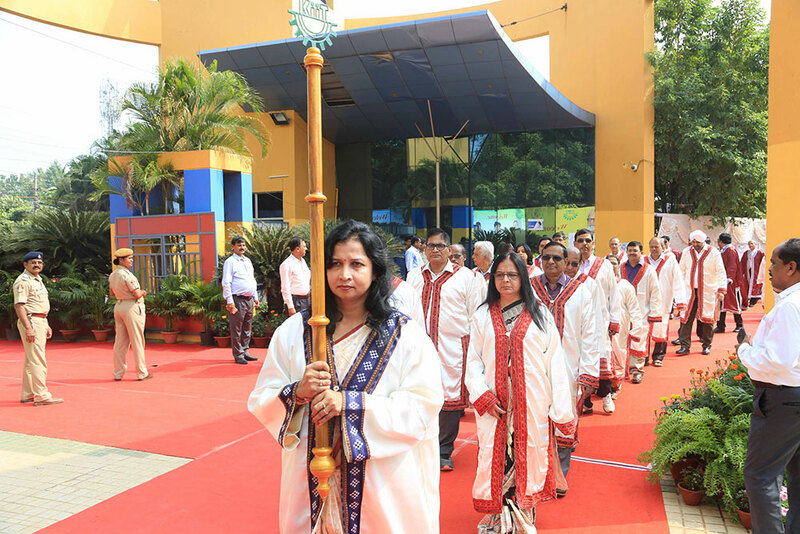 “It is a remarkable experiment that has been made by KIIT by creating KISS,” while expressing the the best wishes for the young graduates passing out. 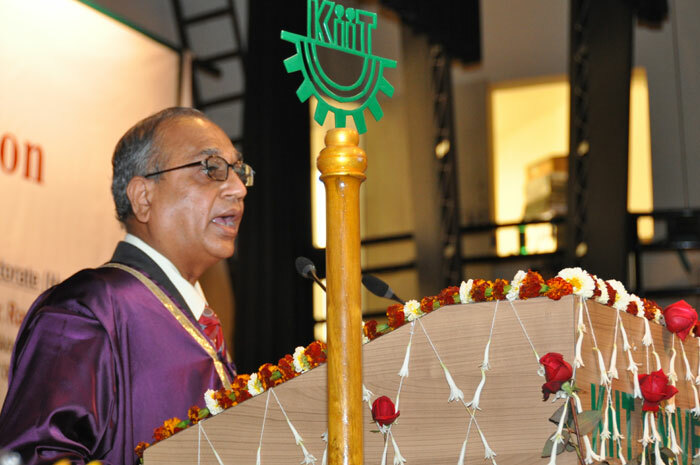 Expressing best wishes to the recipients of Honoris Causa Degree and the graduate students, Chancellor Prof. R. P. Kaushik explained the challenges that higher education in India is facing today. 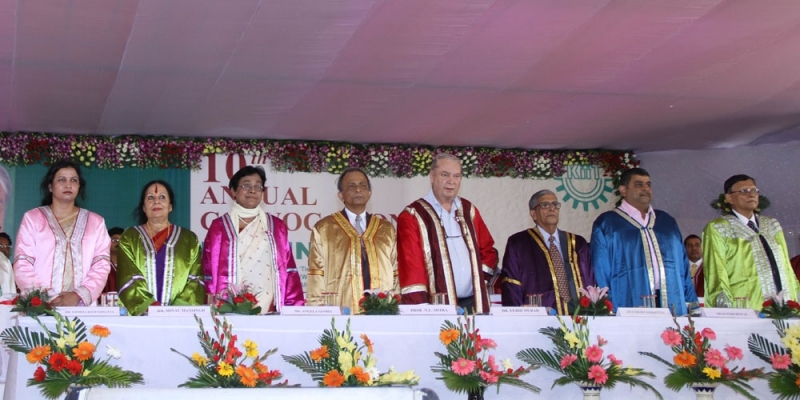 Earlier in his report, Vice Chancellor Prof. A. S. Kolaskar said that the University has taken initiative to give impetus for research on the campus by establishing a center of innovation and research with seed money of Rs. 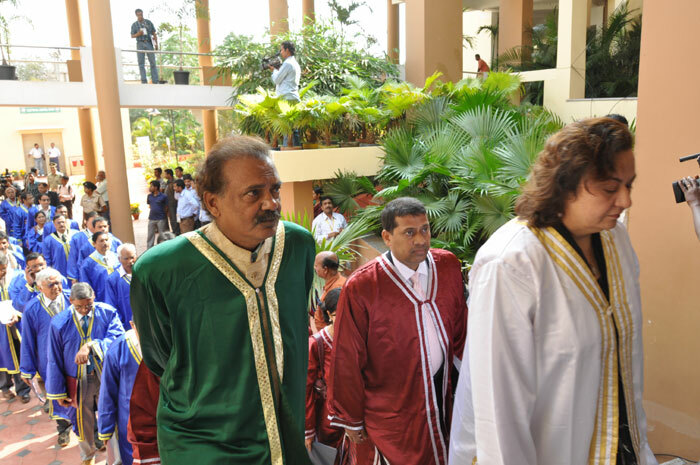 5 crore. 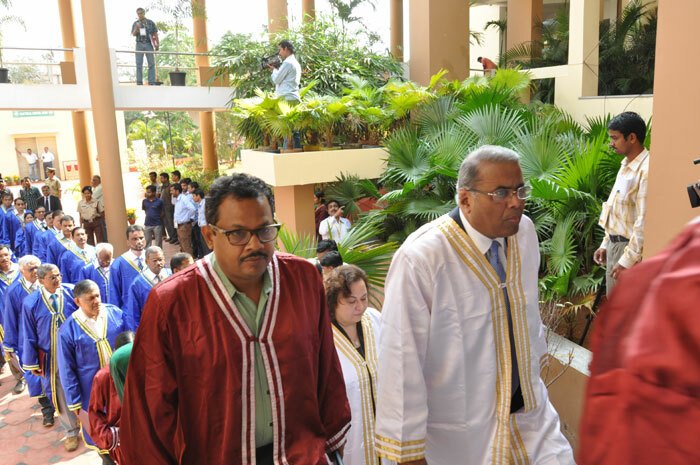 “The University takes its social responsibility very seriously and ensures that no qualified student applicant is denied higher education for want of financial resources,” he said, while informing that free education has been provided to more than 750 students many of whom are tribal or otherwise socially disadvantaged students. 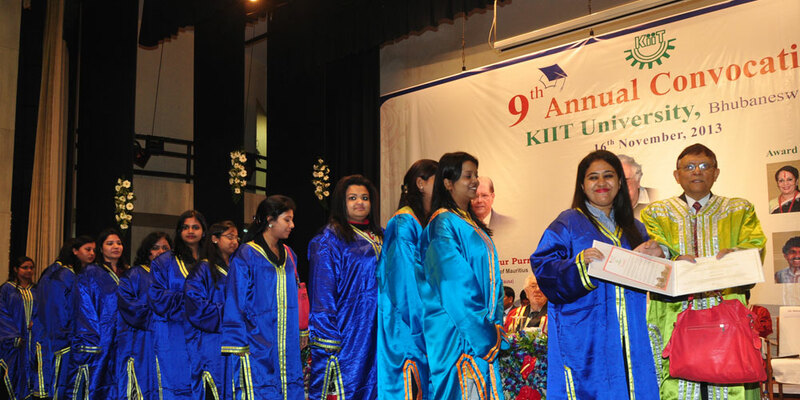 Speaking on the occasion Dr. D. Y. Patil congratulated the young graduates and urged them to work for those who have been left behind in the process of development. 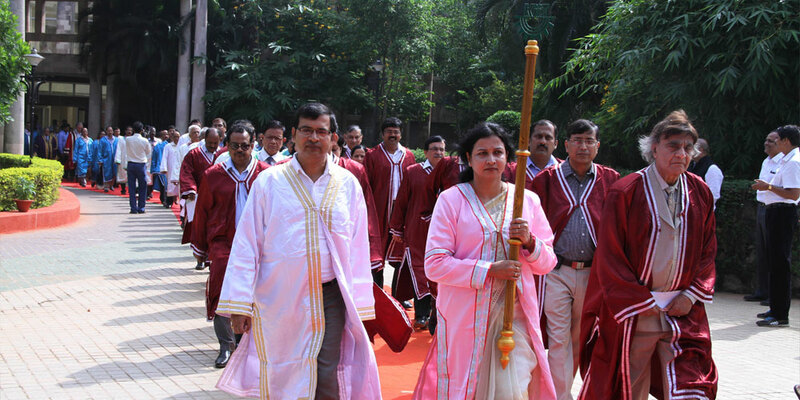 Dr. Narendra Jadhav said graduates have a role model in Dr. Achyuta Samanta and try to emulate him. 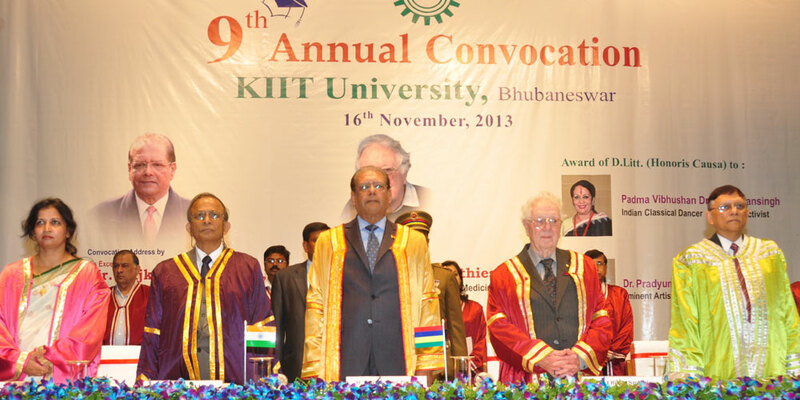 Mr. H. M. Nerurkar expressed gratitude to KIIT University for bestowing the honour on him. 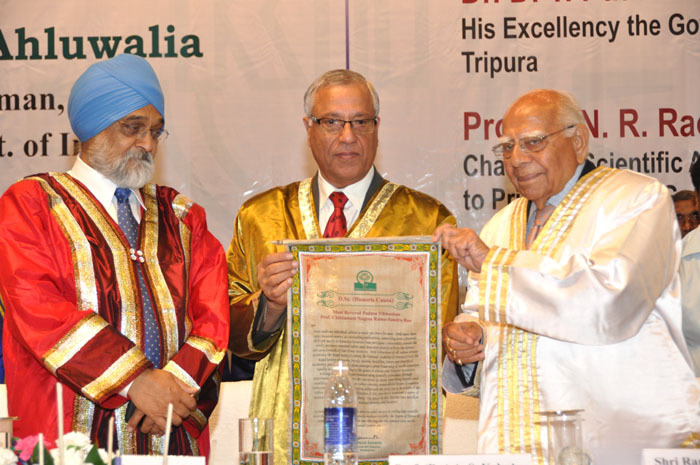 Ram Jethmalani urged the young graduates to use the science for the good of the society. 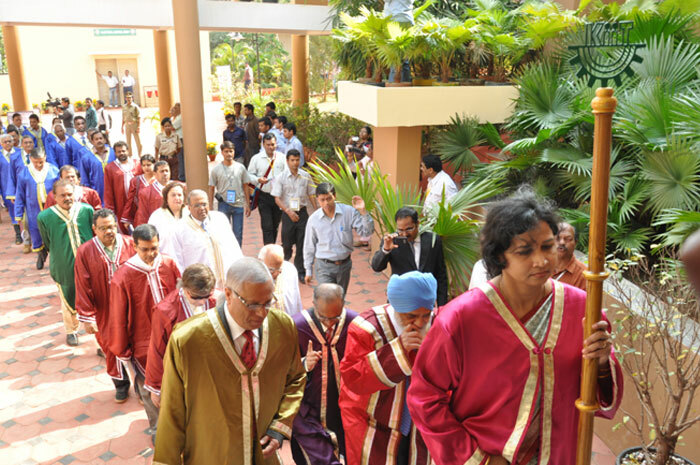 “Science stands at the crossroads today. 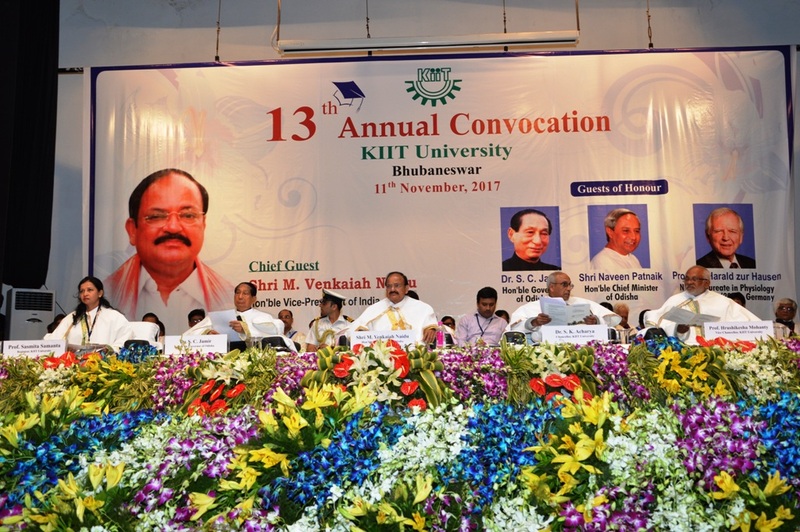 The whole planet is going to become a graveyard unless science develops some mechanism to fight the menace of religious fanaticism,” he said in his acceptance speech. 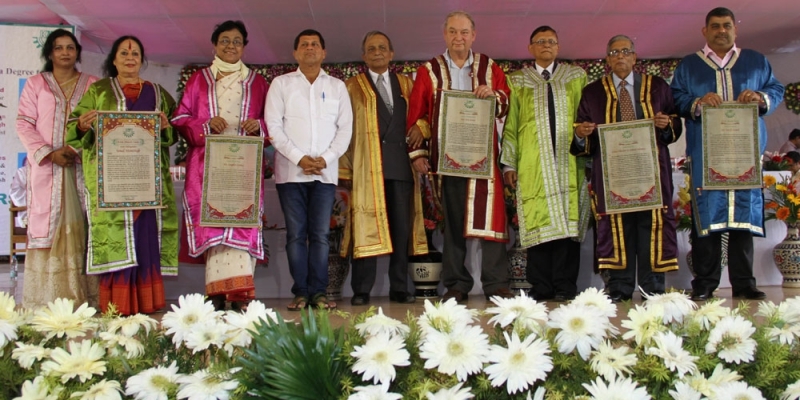 Calling Dr. Achyuta Samanta, Founder of KIIT & KISS as the Bhismapitamaha, the eminent lawyer hailed his endevour of providing education to 15,000 tribal students in KISS as outstanding. 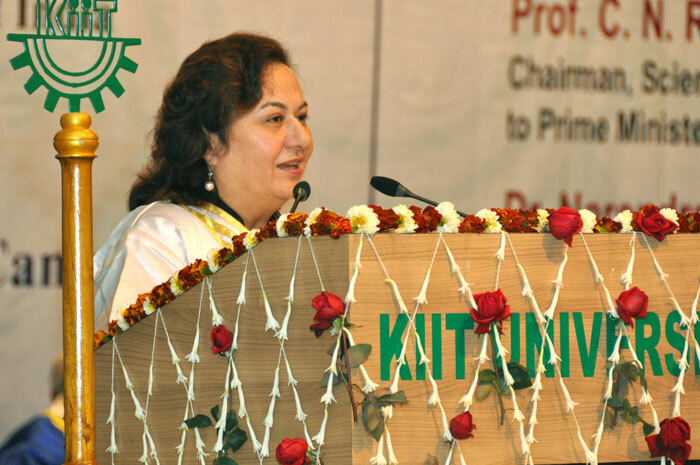 Ms. Pinky Anand expressed humility and thanked the university for the honour.